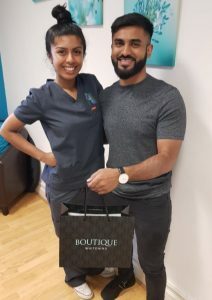 Boutique Whitening is a premium quality whitening gel that delivers superior results, sometimes with a noticeable improvement in just a few days. It uses trays and gel, to gently whiten your teeth, over a period of a couple of weeks. This is the safest and most evidenced-based method of whitening your teeth. 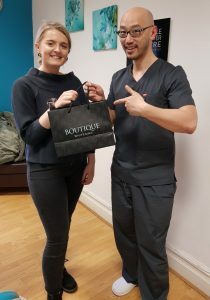 Boutique is designed to fit in with your lifestyle. Now you can whiten your teeth, your way. 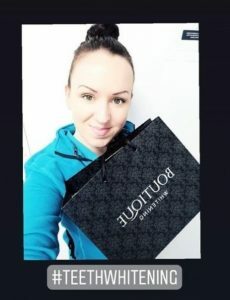 Boutique By Day, whitens your smile with only 1 hour wear time per day. Alternatively, you can choose Boutique By Night, and whiten your teeth as you sleep. 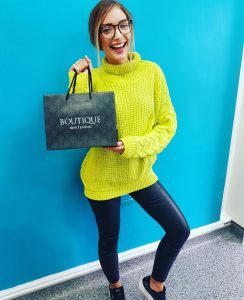 What is Boutique Day White? 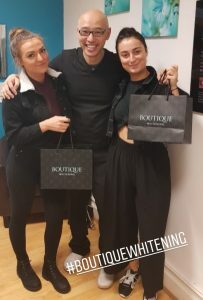 What is Boutique Night White? So which do I choose, Day or Night? Well, that’s usually up to you. So from a lifestyle point of view, many people like the idea of just having to wear trays for an hour. So Day white can be done in the day, or in the evening, and many people choose to do whitening after their last meal of the day, and they are just chilling out for the night. Perfect time to whiten teeth. Some people are too busy and would like the idea of just doing whitening while sleeping. So sleeping with the whitening trays in is easy, and then you just wake up and you’re done for that night. So both options are good, just depends on your lifestyle. However, in some cases, choosing night might not be right for you. This is when you think you grind your teeth at night. If you are a night time grinder of teeth, then doing whitening while you’re not asleep is more sensible. 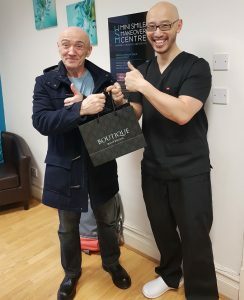 So if you have signs of wear of your teeth, or you think you may be bruxing (grinding) your teeth, then we would recommend the Day, 1 hour, whitening. Otherwise, it’s just a matter of preference. 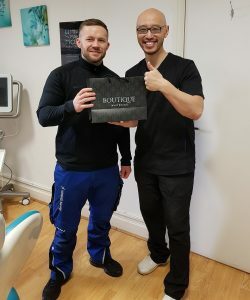 What are the Boutique Trays? 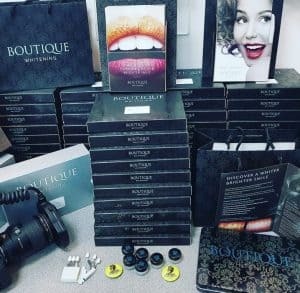 We recommend the use of our premium quality whitening trays to complement our premium quality whitening gel. What is the iTero Scan? We no longer have to use the messy impressions to capture the shape of your teeth. 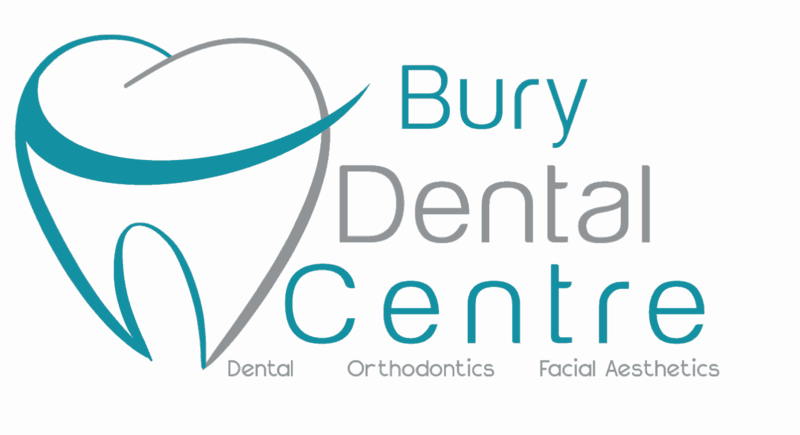 Instead one of our friendly scanning team can do a digital scan of your teeth in 3D. This means less mess and more accuracy, and so better fitting trays. As the scans are sent to the laboratory via the interweb, we can often get trays back even quicker. What must I be aware of before I whiten my teeth? You must be over 18 to start whitening. If pregnant or breast feeding, we cannot do teeth whitening. Teeth Whitening does not whiten crowns or bridges, or implants, or fillings, or dentures. 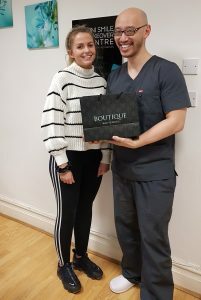 Therefore you must consider whether starting a course of whitening would mean other areas of dental work may be needed after. Whitening can cause transient sensitivity, and most people manage with this, however, only a few will find that their teeth are too sensitive to whiten. We cannot make any refunds if you cannot whiten your teeth because of sensitivity. Whitening gel that gets on the gum area can irritate the gum and cause redness of the gum and sometimes even whitening of the gum area. This is transient, and goes after about a day. The dosing dot, and following the advised instructions of use will help prevent this. Please note if you have white speckles on your teeth from fluorosis or from hypoplasia of enamel, these areas can show up more after whitening. Which gel package shall I choose, the 4 gel package or the 8 gel package? We have both options to suit your budget. 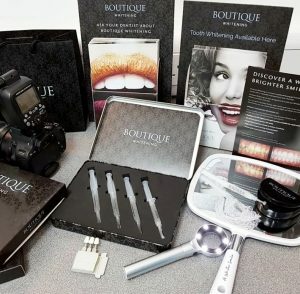 The 4 gel kit is usually enough to whiten most teeth. However, you may still want more for top-ups in the future. Or you may think you have more difficult to whiten teeth. 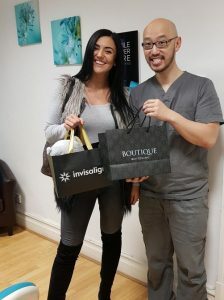 The 8 gel package is even greater value, and this is the one to go for if you feel you want to top-up your whitening regularly, and you want your teeth as white as possible. 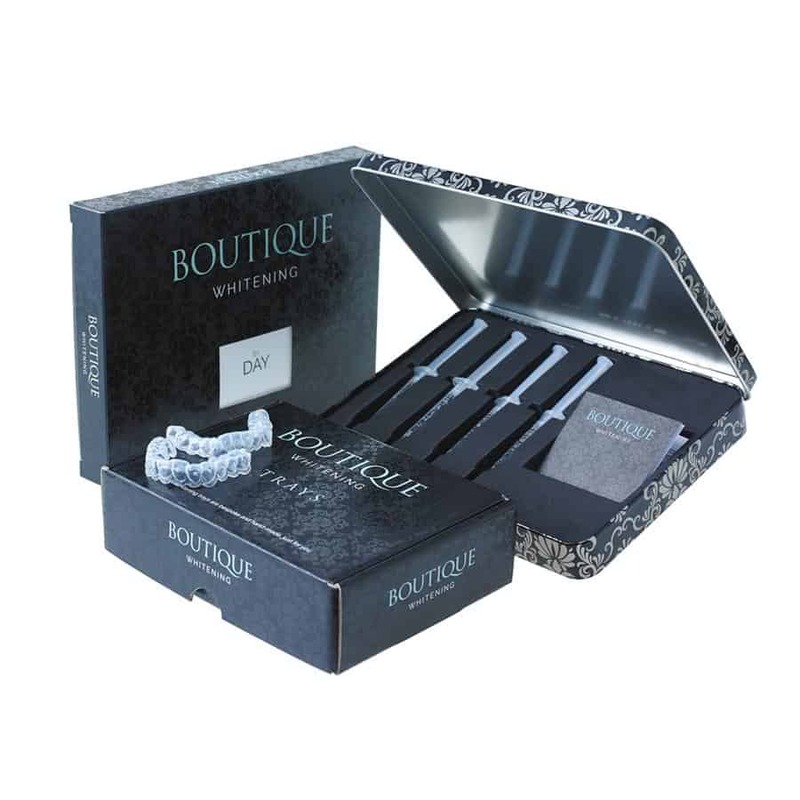 Remember, once you have started whitening with us, you can purchase the 4 gel top-up kit whenever you fancy more. Pearl white is our whitening package that combines Cosmetic Hygiene and Boutique Whitening. 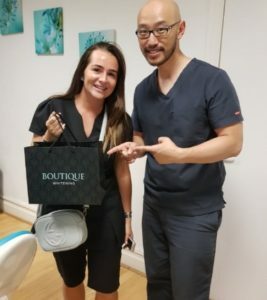 When you book in for Pearl White, you will get an appointment to visit our Dental Hygienist to carry out stain removal treatment, and then one of our team will do a 3D scan of your teeth to order your whitening trays. So the Pearl White is a great package when you want your teeth to be the freshest and whitest they can be. 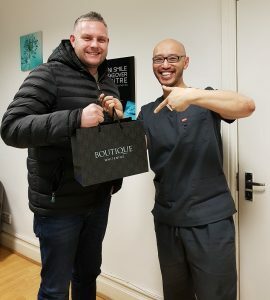 Hygienist visit for Hygiene Scale and Pearl Polish and CleanJoy Finish, as well as Boutique Whitening 4 gel package. When do I start my Whitening? 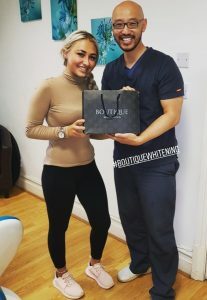 After you have had your scan, it takes about 2 weeks to see you again to give you your whitening trays. It is at this visit you can collect your trays and whitening kit, and we can show you how to whiten your teeth. You can then begin your whitening at home that day or night. How often do you recommend a Top-Up? Your teeth will always look their best after a top-up of whitening. So this depends on you. 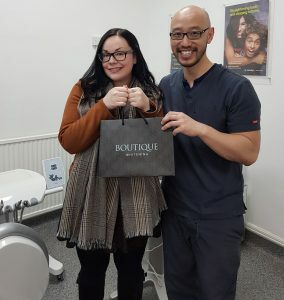 Most of the time, we would recommend a quick top-up a few days before a big event, like a wedding, or party, or if you’re just planning to go out for the weekend. Just doing a top-up the day before going out is a nice feeling, and can give great results. Aside from this, a quick top-up every 6 months is also a good idea. 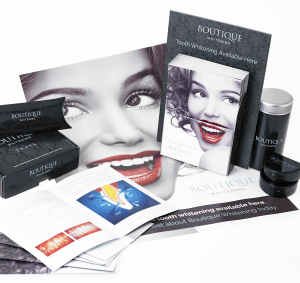 Once you have started whitening with us you can order a 4 gel Boutique Top-up kit. Whitening can be sensitive to some, and this is transient during the whitening phase. Everybody has a different experience of sensitivity, and we have protocols and tips to help with this. Whitening does not harm the teeth in any way. 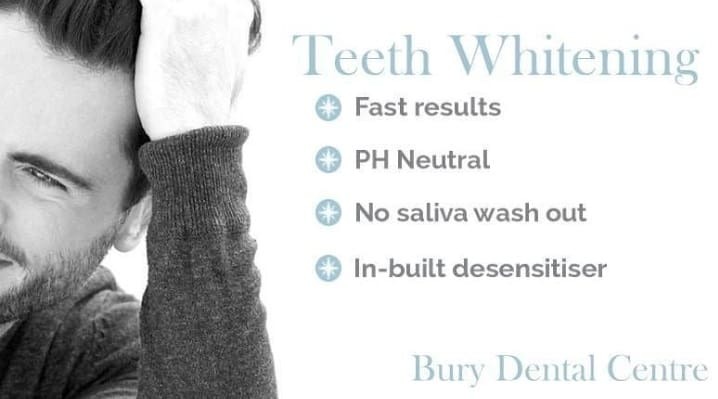 There is no damage to tooth structure, or strength with whitening. 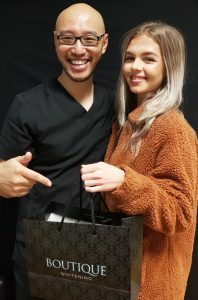 The whitening gel that we use complies with European standards, and we always recommend only whitening your teeth with a dental professional. Can I whiten Composite Bonding, Crowns, Implants, Bridges, Fillings? Whitening only works on your natural tooth. It does not whiten crowns or fillings, or implants or bridges. You can still use whitening over your composite bonding, to help brighten these and to keep the margins white, however, generally it doesn’t whiten these. 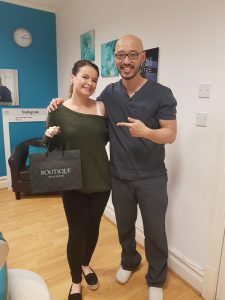 If you are thinking about whitening your teeth, you need to consider whether any fillings or crowns will stand out following whitening, and plan to have these replaced. If you have faint or obvious white spots on your teeth, these may show up even more following whitening. White spots and flecks on teeth may be caused by mottling in the past, from fluoride, or from trauma to the baby teeth. Your teeth can still be whitened, but please note that these faint or obvious white spots will become more white, and show up more. 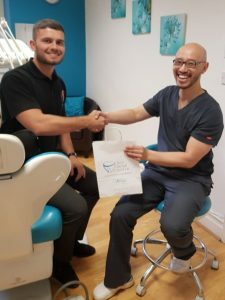 The best way is to still whiten your teeth, and either accept the appearance of these white spots, or to plan for these to be treated with Composite Bonding. 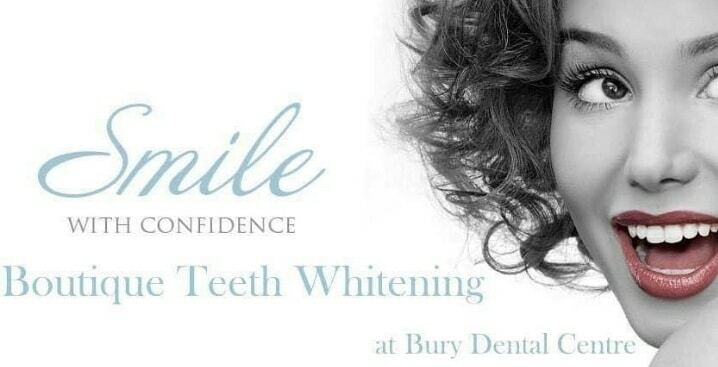 Do you guarantee your whitening? 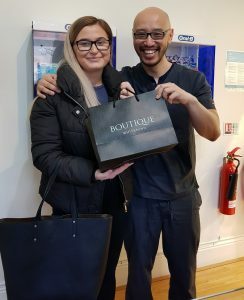 We always aim to make you happy, and we have hundreds of happy patients with Boutique Whitening; we also use the best in techniques when it comes to digital scanning, and use of bespoke trays, and as one of the biggest providers of whitening, we have learnt how to deliver quality in results in our protocol, and service in looking after you. 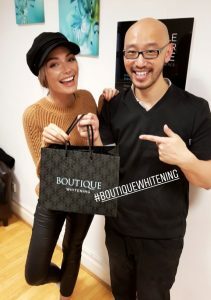 However we can never guarantee a result with whitening. It is very rare for there to be no result, however a few cases may need extra whitening gels, and may take longer to whiten. 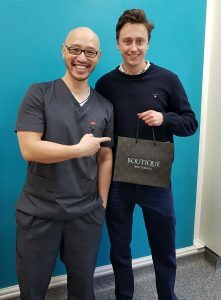 When you attend your review appointment, you will get a FREE WHITENING TOP-UP (1.3g syringe of Pola Day or Night Whitening) regardless of the result. If you fail to attend this appointment you will not get this free top-up. 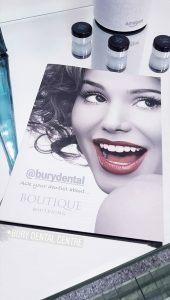 Extra whitening gel can be supplied at additional cost. 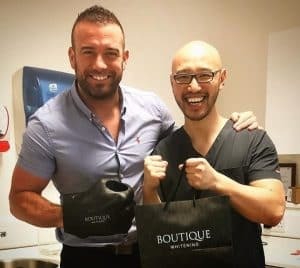 Often in cases of tooth wear or in older patients, whitening may not be as effective, however this may not always be the case and often we still get great results in these difficult cases. In severe cases of tetracycline staining, sometimes whitening can take months, and even after that, supplemental treatments may be indicated. Choose a set time everyday, this can help with consistency. Brush your teeth with a sensitive toothpaste and Floss before whitening. Only use a small amount of gel for each tooth you want to whiten (half a grain of rice). Don’t use gel on your back teeth where no one can see, use on front surface of teeth. Use only light pressure on the gel syringes, and keep the tip close to the tray. Do not eat or drink while you have your trays in. 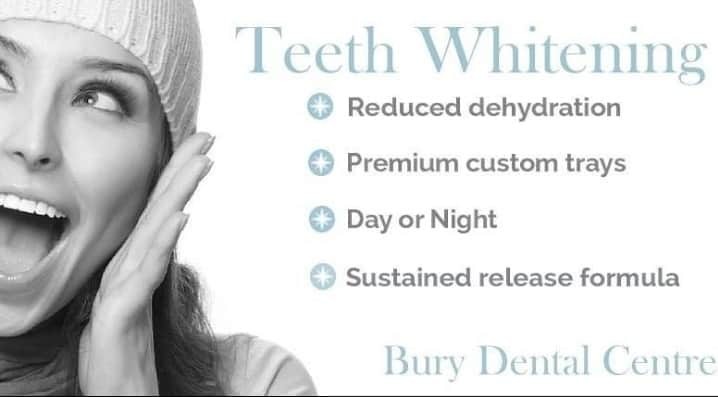 “Day” whitening – just wear the trays for 1 – 2 hours. 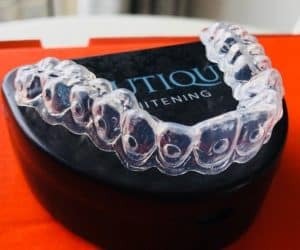 “Night” whitening – wear the trays overnight while you sleep. After whitening, rinse your mouth, and rinse the whitening trays with cold water. Store the trays in your box. Store the whitening gels somewhere cold and dry and away from children. If sensitive, you can skip a day, but try to be as consistent as possible. If sensitive, you can try squeezing a little sensitive toothpaste in the whitening trays and wear this for 30 mins ( I personally do this after my whitening, but it can make the trays a bit messy). Reduce tea, coffee, curries, red wine, and smoking, a good way to help you give up. Don’t expect instant results, some people notice immediate change, some take a week or 2. Different lighting and your own perception of the whitening can be difficult to judge so trust the process and keep at it. Come back for review where we can compare photos. 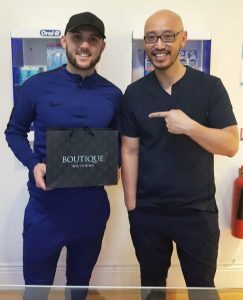 We can’t guarantee results, but there’s no better way of whitening your teeth than professional tooth whitening with gels and trays.